Having grown up in Miami Beach with friends and parents who frequently went to watch jai alai played in beautiful frontons filled with excited spectators and gamblers betting on their favorite athletes—the only sport with legalized betting on humans—I am shocked to learn that the sport is waning, even dying. Especially now that I have started playing the sport . Although kids in Spain and elsewhere have probably thrown balls against walls for centuries, the first fronton was built in Spain in 1798, and the first fronton in the States was built in Miami in 1924. In December 1975, 15,502 people came to the largest attended fronton at Miami jai Alai, and 10-12,000 a night was common. Celebrities and high society went regularly to frontons to watch and cheer and bet. The top players were stars. Friends of mine recall dressing up fashionably most Saturday nights and catching a few games after dinner. There were schools on different continents training hopefuls longing to join the 1000 professionals who played in 10 Florida frontons and six others in Connecticut (3), Rhode Island (1) and Nevada (2). There were also two more in Cuba. But things change. With so few venues, the fronton owners exploited the players, paying them poorly and making them live and work in terrible circumstances. If the players complained, they were fired and sent back to Spain, because their visas were only valid if they were employed. Finally fed up, the top players went on a strike that lasted three years (1988-1991). Many were forced to return home to Spain, and those who filled in were second-rate. Forced to watch lesser talent, the fans rebelled too, and attendance dropped off precipitously. Between 1992 and 2003, most of the frontons closed down. Today in the States, there are only six left in Florida, and sometimes fewer than 100 fans are watching the games. I can’t believe it. 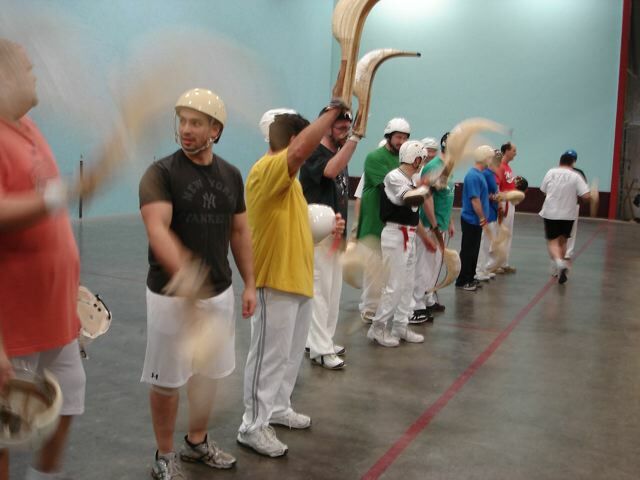 There may be just 500 professionals playing jai alai now throughout the world. 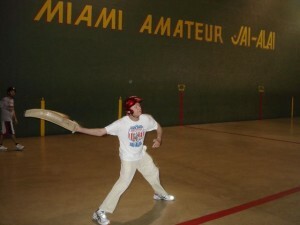 I wrote earlier about my first try at jai alai on November 5th. 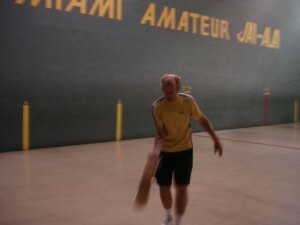 Two days later I posted some videos of pros and one of me that my jai-alai-loving/playing friend Rudy took. To encourage me to play with him the next time I come to Miami, Rudy sent me a professional cesta that he obtained. It’s worth $500-1000. Helluva gift. So last night I went to the only fronton (jai alai court) in Connecticut—actually the only one anywhere in the U.S. outside of Florida—to practice a second time. Connecticut Amateur Jai Alai is located in a warehouse in Berlin, about 20 minutes south of Hartford and 70 minutes from my house. Anyone can rent the big court (112 feet long), although beginners like me are sent first to the smaller court (60 feet). I had already played two matches of tennis earlier for over four hours, so I was a tiny bit tired, but I had no problem practicing jai alai for 45 minutes. A real challenge in the beginning just to reach the wall, much less catch and throw with speed. But after a while, one of the regulars joined me and showed me how to bend my wrist. What a difference. That nuance really helps whip the ball with power. It is similar to a wrist snap in tennis to increase the acceleration. Very exciting! After that workout, I was tired. I had pushed to be there last night during the once-a-month tournament that attracted 38 players competing in 15 games. It was thrilling. It was surprising. Beautiful. I had assumed I would be watching amateurs. Turns out many of the players are former professionals—six in one of the games out of 16 players—who used to compete at nearby frontons that have since shut down in Newport, Rhode Island, Hartford, Bridgeport and Milford, CT. Yet the true amateurs kept it all competitive. Many were very talented. The better players were all concentrated in the later games of the evening. The whole event went from 6:30 to around 11 pm. The owner, Matt DiDomizio, couldn’t have been more helpful. He also was a former pro from Hartford. 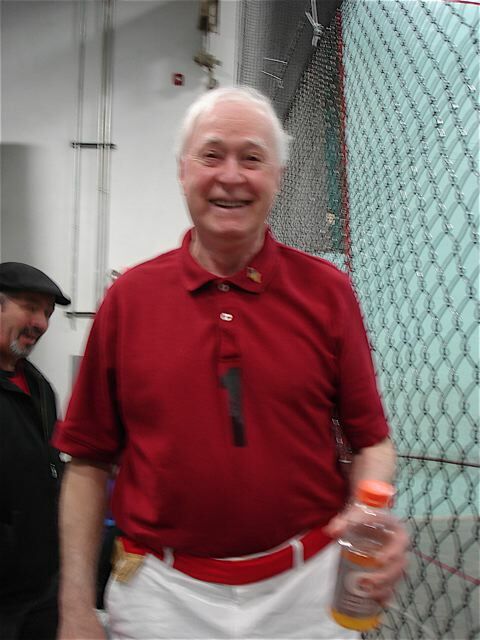 Al Almada appears happy to be the oldest jai alai player in CT...or maybe the entire country! Most guys (no women) are in their 40’s and 50’s, the youngest (Matt’s son) is 26, while the oldest is a month shy of 84! This senior, Al Almada, sat next to me (after he’d come in 2nd and 3rd in his two games of the night) and was very informative. 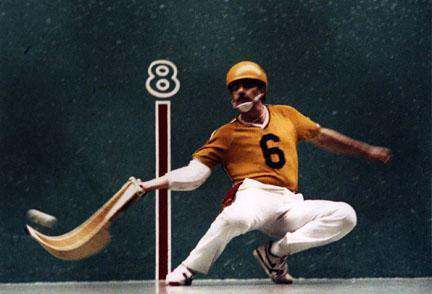 He started jai alai when he was 55 (1982) and even co-founded another amateur jai alai fronton after the Hartford space closed in 1995. Although a professional court is around 180 feet long, 50 feet wide and 45 feet high, the space Al helped open was only 21 feet high. It seems to me you had to be pretty accurate to not hit the ceiling in that one. The bigger space (28 feet high) in Berlin last night has only been open since May 2010, so it’s a welcome addition to all the enthusiasts in the region. 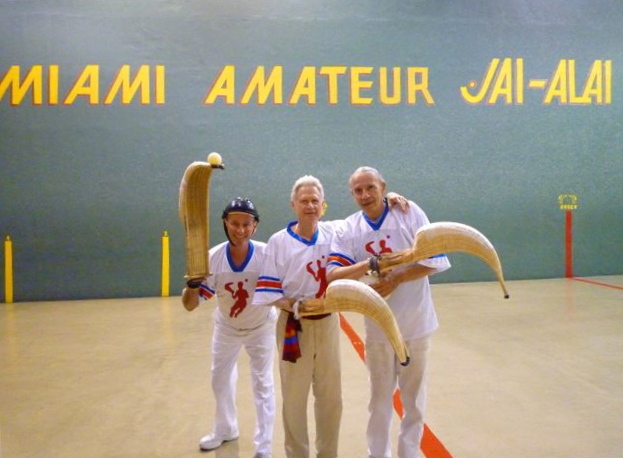 I also met the second oldest player, Jacques Berberian, age 66, who began jai alai 27 years ago. Both men were very energetic and looked like they were in great shape. I am looking forward to the next time I go there to practice, though I am a long way from playing a game. In tennis earlier, I did play games…some of the best ever, though my morning team lost two out of three sets…to opponents who included an 84 year old. What a coincidence! I love meeting these elder skilled players who inspire us all to keep playing and competing. We know they are the very rare exceptions, But I will strive to be one of them. The thrill of a successful placement or return is just too exhilarating to not want to keep at it. 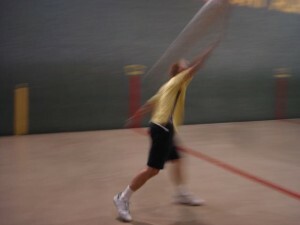 Incidentally you can watch live action at the CT amateur facility (go to Live Feed) or even at the professional fronton at Dania Miami (http://www.betdania.com/liveflash.htm). But you have to look up when the games are on. Of course it’s never the same as being in the stands and feeling the crowd energy or seeing up close the disappointing grimaces a player makes when he’s missed a shot. There is also the anxiety of a possible injury, such as when a ball bounced off the floor and hit someone in the cheek last night. It’s definitely a dangerous sport, and sometimes players have died from colliding with a ball, especially before helmets were required. Al told me that in Mexico the pros DON’T wear helmets to show how macho they are. Not me. Maybe even a face mask will be part of my outfit, when I start competing. 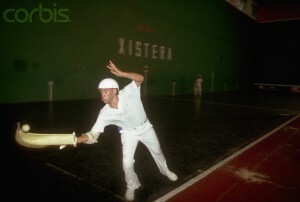 I played amateur jai-alai in high school and my early college years with my brother Harold and friends at frontons in North Miami and South Miami. Mostly we used the hard rubber balls on a smaller court, but occasionally we volleyed with the goat-skin covered “rock” on the long courts. Fun, but extremely dangerous if you don’t know what you’re doing, since the ball is caroming off walls at more than 120 miles per hour. According to Google, highest recorded speed for a throw by a professional is 188 mph. We even owned our own cestas (Basque for baskets). You could buy them at Miami Jai-Alai Fronton fairly cheaply from professionals who tired of their cestas like today’s athletes might switch out gloves or bats or sneakers after only a few uses. All the pros had court names, and all the names were Hispanic, ending in vowels like Valentino or Aramayo. A talented American we knew was the first to break the Basque barrier and become a pro in Miami. His “stage” name incongruously was Joey and he was much taller than his competitors. 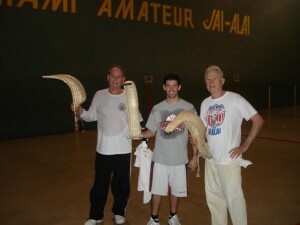 This helps a lot in jai-alai, just as it does in our American sports. We often finished the evening with eating contests at Fun Fair on the 79th Street Causeway (in Miami Beach), replenishing lost calories with pizza burgers, kosher hot dogs steamed in beer, and fried onion rings. My mouth is watering just thinking about it. I sure wish they hadn’t torn that place down. Just a small correction. 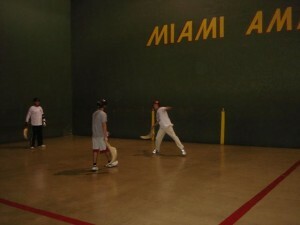 Miami Jai Alai Fronton is still standing and so is Dania Jai Alai in Dania, Fl just 20 milies north of Miami. 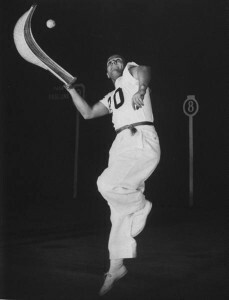 Jai Alai can is played there most of the year even though the crowds are not what they used to be but still as exciting as they were then. Still, most of the players come from the Basque country although there are some Mexicans and Philipinos were the game is also popular. As far as the hot dogs steamed in beer…the best. They were introduced by a restaurant chain called Lums. This was a very popular venue in Miami Beach. It was your typical neighborhood bar. Unfortunately it went out of business many years ago. And the original Lumdog on 41st St just over the bridge from Nautilus Jr High. And only a few blocks down the road from Burger King #1 with the original “have it your way”, and 60 second service guaranteed..I remember it well. This first video will give you a great intro to the sport. The second one shows you what the players are doing, but skip right to 1:10 to avoid a Basque dance and weak titles. My BEST student. Can’t wait until you come back and play with us at Miami Amateur Fronton. Good job, you taught him well. How about both of you come play with us one of these days. Session day/times can vary. One day last week less than two hours after an hour of Florida tennis, I met my friend Rudy who took me to the Miami Amateur Jai Alai fronton, where he plays 2-3 times a week. I have written about his sport before, and was determined to give it a try. Although the court is 90 feet long, which is half the length of a professional fronton, it looked pretty big to me. This was a real challenge. Rudy warned me how difficult it would be. Before going on the court myself, I watched Rudy play for points with two of his buddies, Jeff and Justin. This gave me a first-hand look at what to do. It’s been years since I went to a fronton, where you bet on the pros, and the throws and catches are astonishing. You should see videos of how men climb the side wall or scoop up the pelota after it ricochets off the back wall before it hits the floor a second time. It’s all very artful, a kind of dance, unimaginably graceful. I will post some videos later. When I first attempted to throw the ball (pelota), it came out of the curved basket (cesta) in unexpected directions: I’d aim for the front wall, but hit the floor or side wall instead. Sometimes I hit the padding at the bottom of the front wall. Our cestas were used, but had been hand-made for professionals. They cost just $100, compared to a new one that’s priced at $1000 and is designed specifically for the player who ordered it. My back-hand throw was more successful, maybe because two hands are involved. When I finally did reach the wall, Rudy was amazed and encouraging. He said no one he knows has ever been able to do that so quickly. There was a certain technique I had to acquire, and although I did it, my throws had no power…just like my middling tennis strokes. Catching the pelota was even harder. You have to move the cesta rhythmically, like you’re catching a tossed egg, so it won’t break. Unfortunately, the ball kept bouncing out of the cesta, before I could swing to generate the centripetal force needed to keep the pelota directed towards the center. It takes a very precise, well-timed motion. After an hour of alternating throws and catches with Rudy—we never played for points—I was tired, drenched, and grateful that I hadn’t been hit by a pelota in my head. That could be deadly! 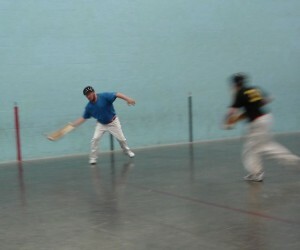 On a full-size fronton, a professional can propel the ball 180 mph. And a regulation, rubber-core, string-wrapped, goat-skinned covered pelota is much harder, and bounces much higher, than the plastic variation that we were using. I find myself, yet again, sitting and waiting at the doctor’s office. It’s been nearly a year now of visiting doctors. I remember my parent’s routine, back in what they called their ‘golden years’. It consisted of going to the bank, attorneys and doctors. My wife, who is younger and in great shape no longer accompanies me on these medical visits. She tells me that I am a hypochondriac. Three years ago we both began working out with trainers. After a year, I looked terrific. I could do 1000 jumping jacks broken up by sets of free weight lifting of over 100 lbs. I was looking and feeling great but always looked at training as a chore and a bore. You constantly get bombarded by society with the idea that exercising is the thing that one must do to maintain good health. Probably true enough but boring. I started to notice I could no longer sleep on my right shoulder. I had terrible pain which was becoming increasingly worse, most likely stemming from old skiing injuries. The results of repeated falls skiing the black runs in Aspen during my youth had finally taken its toll. I stopped training and started with the cortisone shots that eventually led to a medical procedure to decompress the right shoulder. That was my first operation, save for the time that I had to have my finger reattached after a bad motorcycle accident. Not bad, I guess, for a 69 year old guy to have stayed out of hospitals for all these years. I had resigned myself to the fact that the extent of my active sporting life was going to be in rehab clinics. Soon I was off to the JCC pool to meet with an aqua therapist. Next I developed a painful new condition in my leg that eluded diagnosis for nearly a year. This led to appointments with a series of different medical specialists. One day, having nothing to do while waiting to be seen by the latest Dr. of the month, I picked up a local newspaper. Leafing through it, I noticed an ad… “Free Jai Alai Lessons”. Wow! 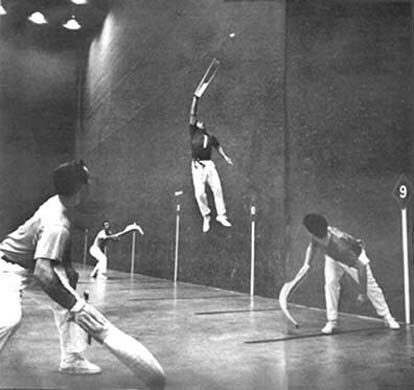 Jai Alai, a game that was so popular in South Florida back a half century ago. As teenagers back then, we would try to sneak into the ‘frontons’ where the pros played at night. These were the days when guys played football or baseball after school and rode bicycles as a form of transportation. Moms did not drive you to soccer games back then. There was no soccer and no SUV’s in those days. We did not stay home to play with electronic devices. We were lucky if our parents had a Hi FI or a Stereo. And we weren’t allowed to touch them. We were always outdoors playing sports or delivering the newspapers after school. It was a great life. Some of us who had just gotten our license would borrow the family station wagon. 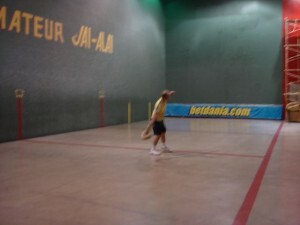 We would all pile in and sneak into the ‘fronton’ to watch the professional Jai Alai players. Most of them were from the Basque country, a part of Spain. They played with their ‘cestas’, a wicker basket and hurled the ‘pelota’, a ball the size of a baseball and as hard as golf ball, against a granite wall at 180 miles an hour. It was played in an enormous indoor court 180 feet long. It was fun to watch not only for the exciting ‘partidos’ or games, but also for the chance to bet on the game and sneak a beer. Some of us went out and bought used cestas and played with a rubber ball on hand ball and racket ball courts. It was so much fun. It was an exotic and exciting game. The girls would come and watch us play after school against the wall of the local Catholic church. I’ve got a $2 ticket on you to show. Excellent article. I enjoyed it. Tell your wife that hypochondriasis shows maturity and good judgment, at our age. Great… Love it. I can remember going to St Pats and watching you all play. I loved your story. I agree with Phyllis, you should write a blog. What ever you want to do with my comments about Rudy. He is so funny, hasn’t changed at all since we were kids. It is great to see that you are friends. I am starting to use weights for my (osteo) bones. Also I would like a little tiny bit of definition in my arms. This is a very fitness oriented area. I think most people at our age should be pro-active about their bodies. You are so cute, Rudy! Your lust for life is delicious! I remember loving the game – it was always so exciting to watchl Today I can only recall one name, Orbea, and he wasn’t even my favorite . Thanks for the memory. It was a great bit on Rudy! You are currently browsing the archives for the jai alai category.